The Friends of Simon Wiesenthal Center Wiesenthal Campus Initiative seeks to empower and assist Canada’s university and college campus communities in countering hate and intolerance at post secondary institutions across the country. This web portal is designed to act as an essential resource for concerned students. Here you will find information about upcoming programs and campus initiatives, as well as resources to help you navigate your campus climate and learn how to react effectively to any challenges you may encounter. Within the last several years, hate and intimidation has been on the rise on Canadian university campuses, creating an atmosphere in which many students feel uncomfortable or threatened. Jewish students in particular are demonized and made to feel unsafe for supporting the State of Israel, as calls for the dissolution of the Jewish state have become a regular feature of life on many campuses. The perpetrators of this new anti-Semitism often try to veil their anti-Semitic intolerance and hate by calling it “anti-Zionism” and invoking the concept of freedom of speech. While legitimate criticism of the Jewish State is fair and warranted, lies, double standards, and hate speech are not. Make sure you Know Your Rights with this guide. Today on campuses, students are faced with the dilemma of balancing and navigating the fine line between Hate Speech and Freedom of Speech. Often, this line gets crossed. Yet students who are targeted fear taking action, in the mistaken belief that hate speech is permitted. So what is Free Speech, what is Hate Speech, and how can one tell the difference between the two? Any speech, gesture or conduct, writing, or display that incites hatred or violence or attacks, threatens, or insults a person or group based on their national origin, ethnicity, color, religion, gender, gender identity, sexual orientation, or disability. Though Hate Speech does not have an official international definition, the Canadian Criminal Code addresses issues of hate speech in Section 319 and Section 318. Canadian campuses have become embroiled in this debate between Free Speech and Hate Speech. Many students wonder what they can do when met with Hate Speech on campus. Contact your campus’ office of equity and cultural diversity to report hate speech, racism, intolerance, or anti-Semitism. If you are unaware of who to contact, email your university’s registrar or information center and explain that you need to speak to someone regarding an issue of racism. If you feel unsafe on your campus due to the hate speech or acts of racism, contact your campus police. Nearly all campuses will have a campus police office located on site. If your campus does not, your registrar should be able to direct you to the correct offices. If you have experienced hate speech or anti-Semitism in class by either a Professor or a Teaching Assistant, and are uncomfortable confronting the educator in person, contact the head of the program’s department. If you express your wish for the complaint to remain anonymous, the department head will be unable to share your identity and will be able to address the issue with the educator. The Simon Wiesenthal Center has a new mobile phone app for students to report and monitor hate on campus. This app, called CombatHateU, is easy to use and allows direct contact with FSWC campus staff to assist students in reporting hatred and anti-Semitism on campus. Contact Jewish student groups or Jewish community leaders on your campus. If you are unsure of who to turn to, the Wiesenthal Campus Coordinator will be able to help you. Send an email to tsteyn@fswc.ca now. The impetus for BDS was the World Conference on Racism held in Durban, South Africa in the Fall of 2001. The conference descended into an anti-Israel hatefest which continued in two further Durban forums in 2009 and 2011. The official launch of the global Boycott, Divestment, and Sanctions campaign was July 9, 2005 following a ruling by the International Court of Justice on the separation barrier between Israel and the West Bank. The movement was started as an anti-Israel initiative by 171 Palestinian/Pro-Palestinian Non Governmental Organizations who called for boycotting, divesting from, and placing international sanctions against Israel. The campaign relies on various UN resolutions as fuel for their messaging and goals. The key feature of Durban I was the launching of the narrative labeling Israel as an apartheid nation, and the beginning of the Boycott, Divestment and Sanctions effort to delegitimize the Jewish state. Almost immediately many left -leaning trade unions, church groups, gay rights groups and student groups jumped on the anti-Israel bandwagon. The BDS campaign has one main goal: to use soft power (economic boycotts, divestment campaigns, and sanctions) as a means of delegitimizing and dismantling the State of Israel. The BDS campaign hides behind the language of Human Rights as a way of pushing their own anti-Israel agenda. BDS founder and leader Omar Barghouti has said himself that he does not believe in the continuation of a Jewish State: “I am completely and categorically against binationalism because it assumes that there are two nations with equal moral claims to the land.” Barghouti’s remarks offer up only one conclusion: the complete dismantling of Israel as a Jewish State. The purpose and methods of the BDS campaign have been criticized for being immoral and unethical in their actions. The BDS movement promotes the delegitimization and defamation of the State of Israel. To delegitimize means to make something invalid, illegal, or unacceptable and leads to the justification of violence and harm against it. The BDS campaign regularly uses words like racist, fascist, and totalitarian to describe Israel; the campaign’s favorite term is apartheid (see: What is Apartheid?). Attaching these words to the State of Israel is not only false and defamatory, but in the eyes of many, serves as justification for the rocket attacks and suicide bombing campaigns carried out by Palestinian terrorists against Israeli civilians. Through their actions, BDS refuses to accept Israel as a legitimate state, and refuses to recognize Israel as a Jewish State. The BDS movement targets Israeli diplomatic, economic, academic, and cultural institutions, regardless of position or connection to the conflict. Academics and culture are valuable institutions that should be protected from political machinations, yet the BDS movement chooses to target academia and cultural institutions, regardless of their connection to the State of Israel. This practice does nothing to affect the policies and politics of the conflict, but instead harms the people on the ground. Israelisincluding Jews, Christians, Muslims, and Palestinians- feel this impact. In addition, academic boycotts work against the basic rights of academic freedom, something that should be protected and that many organizations have failed to protect by supporting the BDS movement. BDS supporters are fervent in their belief of freedom of speech when it comes to targeting Jewish students on campus and Israel in general, but are hypocritically rabid in their efforts to silence academic and cultural support for the Jewish state. The BDS movement harms Palestinians in Israel and the Palestinian Territories. When an Israeli company called SodaStream opened up a factory in the West Bank, the company received severe backlash from BDS groups and affiliated organizations. Campaigns were led across campuses in Europe and North America calling for a boycott of the company and for their products to be removed from local stores. SodaStream’s response? As CEO Daniel Birnbaum says, “At SodaStream we build bridges, not walls.” The West Bank factory employs about 1,000 workers; over half of them are Palestinians. Workers at the factory receive a salary that greatly exceeds the standard Palestinian Authority salary, and many are the sole breadwinners in their households. The BDS movement singles Israel out and holds the Jewish state to a double standard. The BDS main website states that “BDS is a strategy that allows people of conscience to play an effective role in the Palestinian struggle for justice.” This statement is fair in theory, but false in practice. The BDS movement has failed to call out other states for their brutal treatment of Palestinians, instead choosing to focus solely on Israel and any academic, economic, or cultural institution affiliated with Israel. In Lebanon, Palestinians are barred from almost 20 professions and live in abject poverty with no ability to build themselves up. In Syria, Palestinians do not have the right to vote and are barred from becoming full citizens. In Egypt, Palestinians face travel restrictions, lack of access to basic government services, and are denied many basic rights Egyptian citizens are granted. In Gaza, leadership is under terror group Hamas. Hamas leadership is severely corrupt, denying Palestinian civilians many basic rights. Hamas authorities control distribution of funds and goods throughout the Gaza Strip, operate with little to no transparency, and ban all media that is not affiliated with Hamas so there is in effect no freedom of the press. Jordan is the only Arab state to have fully naturalized the majority of Palestinians. Yet even Jordan’s history is not spotless. In all these States and territories, Palestinians are suffering at the hands of the governments, yet no call to BDS has been made. This is just one of the many double standards to which Israel is held. Anti-Israel groups on campus will often chant slogans comparing Israel to an apartheid state or regime. In fact, on many North American campuses, an entire week is devoted to the demonization of Israel in what is known as Israel Apartheid Week. So what is apartheid, and why are these claims false? Apartheid is an Afrikaans word that refers to “the state of being apart.” It is a system of racial segregation that existed in South Africa, enforced by the government from 1948 to 1994. The regime was based on the ideology that different races (whites and blacks) needed to be separated in order to succeed and that it was impossible for different races and cultures to live together. So, is Israel an Apartheid State? The comparisons drawn between South Africa under apartheid and Israel are false and contribute to the delegitimization and defamation of Israel. Put simply, ALL citizens of Israel are equal under the law. Israeli law does not discriminate against any citizen based on their race, religion, or gender: Arab, Jewish, Christian and Druze Israelis have equal rights and access to education, transportation, housing, health care, and safety and security. It is clear that any comparison between Israel and Apartheid South Africa is not only incorrect, but defamatory. These comparisons are useful for anti-Semites who do not believe Jewish people have a right to national self determination in the land of Israel and wish to sway those who are less informed that their cause is just. Every university campus in North America is governed by a student body called the Student Union. This official university governing institution manages all students’ needs on campus from tuitions costs, to campus life, to housing issues, to social needs. The union, like most governing bodies, is elected by the students, for the students; part of your tuition fees go towards funding the Student Union and the policies they uphold. Your Student Union is meant to represent YOU, and all students, on campus. Which means, if your Student Union has taken a political stance on a contentious issue like the Israeli-Palestinian conflict, they are out of line and action can be taken. Your tuition fees fund your Student Union. Don’t let your governing body misrepresent you. To bring a motion to your Student Union, or counter an already proposed motion, consult your Student Union’s constitution or Student Manual. These documents should be posted to your Student Union’s main website. As a student, there are a number of ways you can make a difference on your campus. For assistance in any of these endeavors, email education@fswc.ca. The Friends of Simon Wiesenthal Center (FSWC) provides educational workshops and training for students, as well as seminars and speakers. We strive to create innovative and original projects which actively benefit students committed to creating a more tolerant campus. Students from several universities participated in a Legal Training Workshop with lawyer Ricky Brooks in January 2016. Know Your Rights! Read the guide. 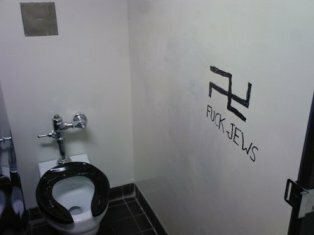 Antisemitism manifests itself on campus in a variety of ways. Calling for the dissolution of the Jewish state (calling for a one state solution). This denies Jews their right to self-determination and a homeland. Differential treatment of the Jewish state. Israel is singled out and falsely accused of committing horrendous crimes when human rights violations are occurring all around it. Many countries across the Middle East are lacking basic human rights and freedoms. Women, homosexuals, and religious minorities often do not enjoy the same rights or privileges as their fellow citizens. This is completely unlike the only true democracy in the Middle East. Israel is a safe haven for all religious and ethnic minorities. Accusing Israel of enforcing a system of apartheid. This insults the memories and experiences of Blacks who suffered under an authentic apartheid regime. In Apartheid South Africa, a minority controlled and oppressed a majority. Lawmakers denied Black citizens their rights. In Israel, the majority of citizens are Jewish – the 20% of citizens who are Arabs have full rights and protection under the law, as do all citizens. The country has two official languages – Hebrew and Arabic. Under an apartheid regime, Blacks were excluded from government and were denied voting rights. Israeli Arabs have the right to vote, a number of elected members of Israel’s parliament are Arab! In Apartheid South Africa, movement and living conditions were very restrictive for Blacks. In Israel, any citizen can live in any city he or she chooses. Unlike in Apartheid South Africa, public facilities are open to all. This includes everything from schools and swimming pools, to universities. In Israel, no-one receives preferential treatment under the law because of their ethnicity or religion. It is important to know that Arabs living in the Gaza and the West Bank are not citizens of Israel. They select their own governments. In the Palestinian territories, Christians, gays and apostates are often persecuted. There is full equality under the law in Israel – this is not consistently applied by Palestinians in Gaza and the West Bank. Shouting ‘Death to Jews’ at campus rallies. This allegedly occurred at McMaster University in Canada on Feb. 29, 2008 and is still being investigated by Hamilton Police. Also hateful is praise for ‘Intifada’ and calls for more of it. ‘Intifada’ literally means ‘shaking off’, but it has come to describe the Palestinian campaign of suicide bombings and mortar firing which specifically targeted Jewish civilians – hundreds of whom were murdered. Calls for ‘Intifada’ are often shouted at rallies across the country. Support for Intifada: Praise for ‘Intifada’ and calls for future Intifada campaigns are hateful. ‘Intifada’ has come to describe the Palestinian campaign of suicide bombings and mortar fire which specifically targets Jewish civilians – hundreds of whom were murdered during the last Intifada from 2000 to 2005. 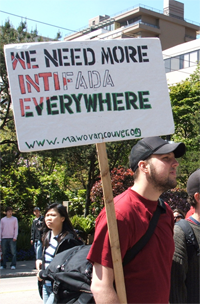 Calls for ‘Intifada’ are often shouted at rallies across the country. Trivializing the Holocaust. By drawing incorrect, offensive comparisons between the living conditions of inhabitants of the Palestinian territories and the plight of prisoners in Nazi concentration camps. Also hateful is the drawing of an equivalency between soldiers of Israel’s national army and the Nazi S.S.
Justification of the deaths of innocent Jews. Some campus advocates refer to suicide bombings as legitimate ‘resistance’. The violent murder of innocent bystanders can never be justified. It is terrorism – and homicide. Arguing that ‘Zionism is racism’. Although the State of Israel is nowhere near perfect, the belief that the Jewish people should have a state (as it did in the past) cannot be considered negative in any context. References to Zion, Israel, and Jerusalem fill the canonical texts of Judaism, arching back thousands of years. Most Jews look upon Israel favorably, so to paint millions of people with the label ‘racist’ is unjust, and ironically intolerant. Calling for academic boycott of Israeli schools and professors. Originally proposed in the UK, this discriminatory practice targeted the professional lives of all Israeli Jews, irregardless of their political opinions. 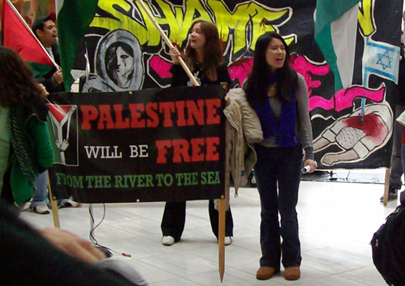 As expressed by Labor parliamentarian John Mann, chair of the All-Party Parliamentary Group against antisemitism: "Boycotts do nothing to bring about peace and reconciliation in the Middle East but leave Jewish students, academics and their associates isolated and victimized.” Canadian schools have followed suit and university presidents refuse to engage in this hateful practice. The original boycott motion has not been implemented, because of fears it would breach the British Race Relations Act. The last organized boycott of Jewish academics occurred in Nazi Germany, under the orders of Adolf Hitler. Friends of Simon Wiesenthal Center for Holocaust Studies (FSWC) is looking for student ambassadors on campuses across Canada. FSWC exists to counter anti-Semitism, hate, and intolerance through education and advocacy. We aim to promote tolerance, justice, and human rights, and work to keep the memory of the Holocaust alive through education. 1. Represent FSWC on their campus. 2. Build relationships with other Jewish and non-Jewish student groups. 3. Build a plan at the start of every semester with the national coordinator of the organization to help tackle issues on campus. 4. Organize events during the semester that fit with the organization’s agenda and goals. 5. Monitor and document any acts of antisemitism, hate and intolerance on campus and report it back to the national coordinator at the FSWC headquarters. 6. Be the “eyes and ears” on the ground, helping FSWC develop effective, appropriate and engaging programs for the students by the students. 1. Every student that wants to be an ambassador needs to send a resume to tsteyn@fswc.ca and a statement explaining why he/she should be an ambassador. 2. FSWC will interview each student prior to making a decision. 3. The student will be the ambassador for the entire semester, and at the end of the year FSWC will do an evaluation of his/her work. 4. Every ambassador will get a ticket to the Spirit of Hope Benefit and a special seminar in FSWC's offices. 5. Every student will receive a scholarship. If you wish to become an FSWC Student Ambassador on your campus, or if you wish to learn more, please email: tsteyn@fswc.ca. We are always looking for motivated, passionate students to help us in our mission. To report hate on campus, please email education@fswc.ca. To get involved with FSWC, email education@fswc.ca.